Have your child pick one area in your home in which to do homework and provide a few things to keep the distractions away. Use cardboard, such as a presentation board/form board to create an enclosure that will assist them in completing their homework with the least amount of distractions. They can decorate it themselves with all their homework essentials! Get the instructions here. When it is time to do homework, children always have an excuse to procrastinate. A Portable Homework Caddie will eliminate the ‘looking for a pencil or ruler’ routine! Purchase a Scrap booking caddie or a fishing box with dividers and place all the needed supplies inside. Start saving your recyclables! Have your children use recycled materials, such as cereal boxes, soup cans, tissue boxes and yogurt containers to organize their school supplies. Use an egg crate to store eraser heads, paper clips, stickers and push pins. All of these items can be decorated with markers, paper, fabric and stickers. By children creating their own desk organizers, they are most likely to use them and keep the clutter under control! Get the instructions here. 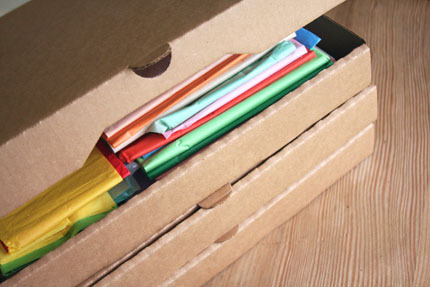 A creative and cleaver way to store your child’s artwork, school work, and other scrapbook type keepsakes is to place them in a pizza box (unused!). Your child could have a pizza box filled with memories for each year they attended school. The boxes can be easily stacked one on another in a closet or under a bed. Your child could create a collage of all their favorite things that year to cover the box. This is a great idea…simple and creative!